Are you a big time foodie, active on instagram? If yes, then just wait, wait, wait! This delicious post about best food instagram accounts of 2018 that every food lover must follow will make you grin from ear to ear. This instagram account is of a food and beverage company. One of the thrilling instagram account wherein you get to see mesmerizing food photos. This is yet another thrilling and best food instagram account of 2018 that will thrill you to bits. Here you will also get to see various keto foods. This is one of my favourite because this instagram account shares the best keto recipes that helps to keep you fit. This is another best instagram account to follow for foodies. 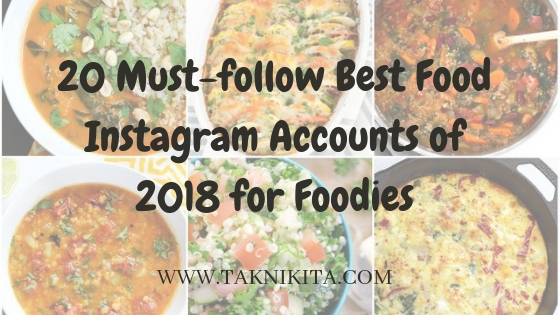 Nikita shares best food blogs to follow for foodies, on her instagram profile. She also loves to write poetry, science fiction story, romance stories, etc. You can buy her book through Amazon in just a few clicks from our Amazon account. She also loves cooking lip-smacking cuisines. Another thrilling food instagram accounts to follow for foodies is of this fit foodie. Here you will find toothsome food that this foodie loves to share from offline world to online platform. She is a blogger and a foodie to the extreme. This instagram account has the images of delicious foods of different varieties. Anna Lindberg loves to share various mouth-watering smoothies. Here you will find the colourful smoothies that will make you jump out of your skin. Another best food instagram account that is a must-follow for the foodies around the globe is by Priyanka. She too shares amazing food images and she also loves cooking. This instagram account will keep you captivating from different foods of Delhi. It will eventually make you grin from ear to ear. This is another best food instagram account to follow for the food lovers. Here you will find mesmerizing food images that will thrill you to bits. This is yet another must follow best food instagram accounts of 2018 to follow for the food lovers worldwide. A Delhi based food influencer loves to click and share engaging food photographs that will leave you mesmerized. It is one of favourite food instagram accounts that has the engaging photography of the food that will make you grin from ear to ear. It is the striking instagram accounts of 2 sisters who love to explore travelling and also food to the core. They love to share stunning images of food that will thrill you completely. It is another best food instagram account to follow for the food lovers. Here you will find lovely mouth-watering food images that will leave astonished. This food instagram is handled by 2 foodies who love to eat tasty foods and share the images of assorted range of delicious foods. This instagram account has the drool-worthy food images that will leave you wonder with joy. It is a must-follow food instagram account for the foodies. It is also the must-follow food instagram account to follow for the foodies. Here you will find flabbergasting food images that will thrill you to pieces. Another must-follow food instagram accounts for foodies that will stun the food lovers. It is the instagram account where you will find various kinds of food images that will leave you thrilled completely. 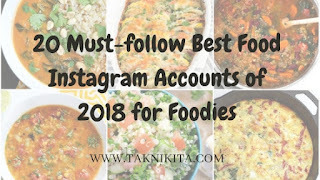 This one is my favourite best food instagram accounts of 2018 to follow by all the food lovers. This is another best blog to follow for the foodies around the globe.